Looking for tips on what to do in Vienna, Austria? As part of our city guides series we interviewed Doris Neubauerwho grew up in the countryside about 40 minutes away from Vienna. When she was 18, she moved to Vienna to study and lived there for about 14 years. Doris share’s with us her insider travel tips and knowledge on what to do in Vienna for those looking for the best places to see, eat, stay, drink, and explore. Looking for a secret hidden destination in Austria? There are many reasons why to visit Vienna. For some it´s one of the historically important old cities in Europe, for others the core of the classical music scene, for others a place famous for its architecture such as Jugendstil, for others a must-go in terms of theatre and culture. And all of them are right. The clean, functioning, a little bit slow and old city has a unique charm. Within and behind the old walls, there is a young heart pulsating, vibrating and showing it’s creativity. And if you listen and watch carefully, you can experience it yourself. For me, one of the best things to do in Vienna is sit in one of the typical Viennese coffee shops such as Hawelka, Sperl or Rüdigerhof, order a coffee like Melange or Cappuccino – no, not the Italian one – and watch the people. I am sure you get a feeling of the city and its inhabitants by spending an afternoon like this imagining that philosophers, students, musicians, politicians have been sitting exactly where you are sitting now centuries ago and that the most important movements and decisions were given birth to in coffee shops. One must visit the iconic Schönbrunn Palace as it is one of the most historical and important buildings in the country. You’ll want to book your skip the line tickets in advance to avoid the long queue. Click here for tickets. You cannot and should not avoid the 1st district with all the historical buildings along the Ring or around the St. Stephens Square. But you should also go further. To the Naschmarkt area, not only looking at the market stands but also a bit up to all the beautiful Jugendstil buildings of the right and left. On both sides of the Naschmarkt, both in the 6th and in the 4th and 5th district, you can find nice restaurants to eat and sometimes tiny, interesting boutiques. I also like the 2nd district, the former Jewish district with its reminders of this very important group in Vienna. 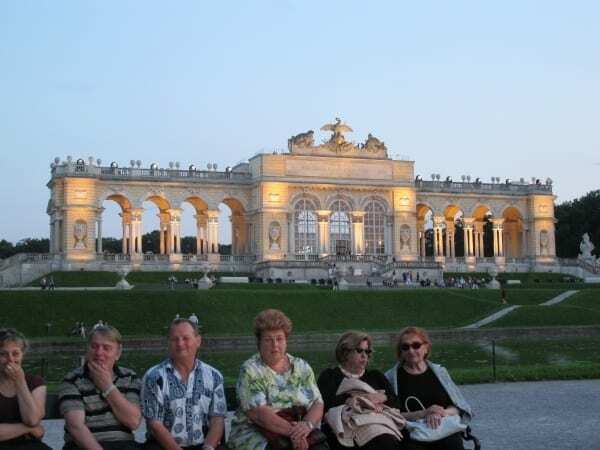 The Vienna Pass gives you free entry to 60+ top Vienna attractions, Hop on and Off sightseeing tours, and fast track passes at popular Vienna attractions. Get yours and save money on travel to Vienna. If you love the countryside or greener areas, don’t miss going up on one of the hills such as Kahlenberg or Cobenzl and to explore a bit of the Wienerwald (Viennese forest) – passing by you can go the Heurigendorf Grinzing, which is more a touristy spot now but still quite lovely. Just don’t eat or drink anything there as it is more expensive than in other places. 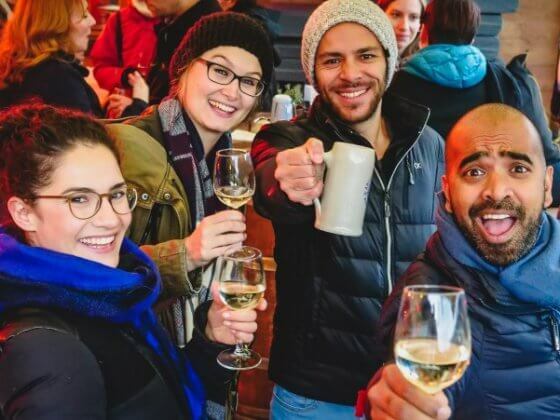 If you really want to go to a Heuriger, the typical wine tavern with home made food and home made wine, you should definitely try to go to the countryside (Lower Austria) or in the outer districts such as the 23rd or 21st district of Vienna. There are restaurants for everyone, every taste and every special need in Vienna. A good source for places to eat in Vienna is the website “Wien wie es isst” where you can search for anything you want – food wise. Unfortunately, the website is only in German. Another good source of what LOCALS love to eat in Vienna and where they go is Spottedbylocals: Here you can find tips and must-goes recommended by inhabitants of Vienna. Some sweet desert such as Apfelstrudel, Topfenstrudel or some of the cakes in a Viennese café. But please, don’t take the highly overrated Sacher Torte, almost every desert is better than this dry chocolate cake which is only pricey because of the name. For people who are not vegetarians like me, there is another typical Viennese dish – especially after a long night: The “Eitrige”, a hot sausage with cheese you get on the many stands everywhere in the city. Spottedbylocals is a good source for bars and clubs in Vienna. A good location to spend a night in town always is the area around the 7th and 8th district, as lots of bars but also nightclubs are located here. Or to say it with the words of a friend: from the pre-drinking to dancing the night away, here you can find everything. And everything is within walking distance. For the pre party, I can recommend either the quite new “Dachboden” at the 25hrs Hotel or the more traditional Café Europa, also the quite interesting Donau or Café Leopold are good for pre-glow as well as the later part of the night. For clubbing and partying, go to Grelle Forelle, Pratersauna or – for a little unique experience – to Tanzcafé Jenseits. For a unique local stay check out the gorgeous homes available on Airbnb. Click here to see what is available in Vienna. Moreover, the community in Vienna is pretty active and there are lots of things going on every single day. You should never visit Vienna without going to the Naschmarkt, the oldest market area. You can find everything from organic bread to Asian food supplies to Turkish delights. If you want to go for vegetable-fruit-or spices-shopping, that is the right place. And on Saturdays, there is a huge flea market on the Naschmarkt area as well. The big shopping street is Mariahilfer Straße, and, of course, you can also go high-end shopping for Gucci & Co. in Kärntner Straße and around St. Stephens Church. But if you are interested in unique clothes, you should go a little further within the 7th district. Just behind the big commercial shopping street Mariahilfer Straße, you can find small boutiques as well as Austrian and international designers in Lindengasse, Siebensterngasse, Kirchengasse and this neighbourhood. A good source for shops is Die Stadtspionin, only in German though. A good source for festivals and events in Vienna is the official website of the city http://www.wien.gv.at/english/. Some of the major events or festivals are the Vienna City Marathon, the party against HIV/ AIDS Life Ball, the famous Opernball, the biggest European open-air festival Donauinselfest, the theatre festival Wiener Festwochen and Viennale, the movie festival – but there is something going on all the time. When visiting a city, I LOVE to walk – it is a big part of the experience, of the adventure for me: getting lost in the city. In Vienna, everything (touristy) is within walking distance. And if you are tired of walking around, you can take the underground or the buses or trams. You can find your way either by asking around or by planing in advance via http://www.wien.gv.at/englis. Arriving in Vienna, you have WiFi access for free at the airport – but don’t take it for granted. In the city itself you don’t find WiFi spots that easy. Yes, there are plenty of Cafés and Restaurants with WiFi, but the public buildings are still no equipped with free internet. There is hardly a best time of year to visit Vienna. Personally, I am enchanted by the winter time right before Christmas as there are lots of traditional (and touristy) Christmas markets everywhere in the city, everything illuminated and has a special old charm. But then, I also adore spring and autumn when the first sun rays are out and – as if everyone was hiding during the sometimes harsh winters – now, there are people everywhere. It feels like an awakening of the city, especially here in Vienna. Especially by travellers from the US or Asia, Vienna is mostly mistaken for being one of the Cities of Eastern Europe. Well, I have to tell you, it is not. It is exactly in the heart of Europe and easily, directly accessible via train by other “old” cities such as Budapest, Bratislava, Prague, Munich. 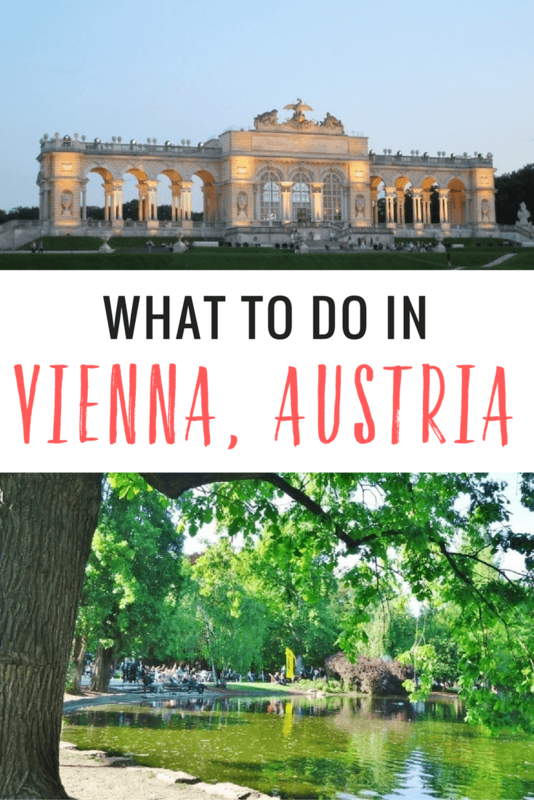 As a traveller, I would never rent a car going to or from Vienna to any of these cities – even though it might be easy, it definitely is expensive and not worth the trouble. If you want to get there by air plane, the airport for the cheap airline Ryanair actually is not in Vienna but in Bratislava (even if you book “Vienna” for example, the airport is Bratislava). That´s not a problem, as there are buses waiting for you at the airport in Bratislava to take you to my city. I still prefer Air Berlin, which takes off from the airport in Vienna. Getting there by the way, you can either take the – expensive – CAT (city airport train) or the – cheaper – bus from the city centre or train from Landstraße-Hauptstraße (U4/ U3 station). I would recommend nothing less than Am Himmel – which means “in paradise” or “in heaven” in English. I actually do not know if this place is part of the guidebooks, but even if it is, I recommend going there – especially if the weather is nice. I hosted a lot of couchsurfers and got plenty of visitors from foreign countries, and usually, as a tourist you hardly go there as it is not as easily accessible as other places. Am Himmel is an outdoor area where you not only have a great view at Vienna, you feel like on the countryside even though it´s in the city. I said it´s not as accessible as other places, but it still is accessible without car: Just take the bus 38A from the U4 stop in Heiligenstadt to Cobenzl. Then you have to walk a bit up the hill and at the crossing of Himmelstraße / Höhenstraße there´s the entrance to the restaurant Oktogon Am Himmel. I usually get lost there, but in the end, I always find my way. A little bit passed the restaurant Oktogon, you can find a celtic tree horoscop or Lebensbaumkreis as it is called in German. While resting and preparing a picnic, you can search for YOUR tree which symbolizes your life, tells you more about your personality … and by the way, I am a fig. Today, the sun was shining, reflecting images in the golden ornaments of the old buildings, and I loved Vienna sitting in the Stadtpark, watching students having a picnic in the grass, busy suit-wearers talking on the phone and old ladies walking their dogs chatting about the latest disaster with their neighbours. And all this took place in the green heart of this city of old buildings and piles of history, which sometimes seems to never change but in the end really does. Check out this Alpine village that made this list on destinations in Europe on a budget! Booking.com has 1,062 properties in Vienna from hotels to apartments and hostels. You get free cancellation on most rooms and a best price guarantee. Check out this gorgeous ski resort village of Kitzbuhel in Tirol outside located outside of Vienna. Vienna sightseeing tour in an electric vintage car! BIO – Coming from a small Austrian village, Doris feels most at home on the road. Her list of things to be seen and experienced is endless. And when her feet get too itchy again, she packs her backpack and moves on to the next adventure. Doris is interested in movement, developement, news, different things, connecting on- and offline – but also in sustainability, environment, new energies, social things, fascinating people, who are doing something. You can read about both at Tripwolf and at Little Miss Itchy Feet or via twitter. Area 47, Otztal, Austria – is this the world’s most extreme water park? Vienna was one of my favorite cities in Europe. It just seemed to easy to be in. I loved eating the Apfelstrudel as well. John, wow, among all the great cities in Europe Vienna was one of your favorites. Good to hear 😉 I feel the same about my hometown actually. I went to Vienna in December and it was absolutely beautiful! I stayed at the Wombat Hostel at the Naschmarkt and I couldn’t have had a better time. So clean and in such a good location. If you stay here, a must do is the free walking tour. The Naschmarkt is also pretty phenomenal! My sister and I loved to eat at Neni (try the cocktails – so good!) We went back about four times. We also found a really good bar just near Wombats which is an old cinema turned bar. If you’re there in winter you can’t go past the markets. The best ones were at Schönbrunn Castle. And I agree with the Sacher torte comment. Not a great cake and you definitely pay just for the name. Also check out St Stephen’s Cathedral in Stephensplatz. Absolutely amazing! I feel the same about my hometown, John: It´s among my favorite cities in Europe too, even though there are plenty of amazing places all over. I think such posts with insider information are a great value for travelers. Local people tell about interesting places and give sound advice and divert from tourist traps or paying through the nose. Thank you very much. I have always wanted to see Vienna, I’m a Marie-Antoinette fan. Need to visit Vienna again soon. Missed out on a lot of the city due to suffering food poisoning. I have to tell you – I love the way you write your posts! So much information in them. Thank you! You’ve certainly made a case for Veinna. What a lovely place to visit. A good reminder for me to go back! Hi, I am visiting Vienna in september for the first time, I am just staying 2 days, what do you recommend as a must for such a short stay? Great information! Heading to Vienna tonight for 2 days so will definitely check out some of these suggestions. Thank you, Doris! I’m private guides in vienna but I still haven’t know about some places you’ve described in your review! Excellent! LOVE it when a post has all the vital information you need for first time travelers. We’re heading to Vienna in November and I am most looking forward to the Christmas Market.. I hear it’s pretty awesome. Thanks for a informative post! Best time of year to be in Vienna is at New Year. Atmosphere is really great especially in the centre of the city. Summer in Vienna is like a dream. When I make it to the city I always go to relax at the alte donau and spend the evenings at the Movie Festival at the Wiener Rathaus or to Sand in the City close to the stadtpark. They have great food there and its my top tip to go in the summer. Deb, thanks for Doris’ piece. (I met her at the Vienna Coffeehouse Conversations back in August, lovely lady.) As a native Viennese I can relate with so much of what she is saying. Plus she has a few good tips that I have been planning to do for so long, like visiting Am Himmel and re-visiting Tanzcafe Jenseits. A great inspiration even for natives, thanks! This is really incredible! almost everything a person would ask to him/her self about going to Vienna will now have a partial answer and guide. thanks for this post! Every time I go there I discover new things, streets, monuments and secrets. I love dining over there, nice restaurants and in the summer time the city part called Bermuda Dreieck is just lovely. Last time I was there I looked at many sights there and for the first time also saw the University of Vienna and the votiv church. I tried out for the first time and audio guide I had from http://www.viennasights.at which I can really recommend. Another thing I found out about is the restaurant called Steirerstöckl which was just great. Traditional Food, so good…. :) Just google the restaurant:) And also thank you for you two making this blog, I always look it up when travelling somewhere… Your China insights for example also helped me a lot to plan my journey:) Thanks and see you! Over the past few years I have traveled to Vienna for 4 times. The suggestions in this article are great and right on the spot. But I wanted to share my special highlight with you guys. Pick a night n the middle of the week and strall around the first district around the Hofburg at around 2am. It is the most amazing feeling when you strall around with no people around and all the historic buildings ar flooded with lights. You truly feel like the emperor yourself! Have a great trip to Vienna! 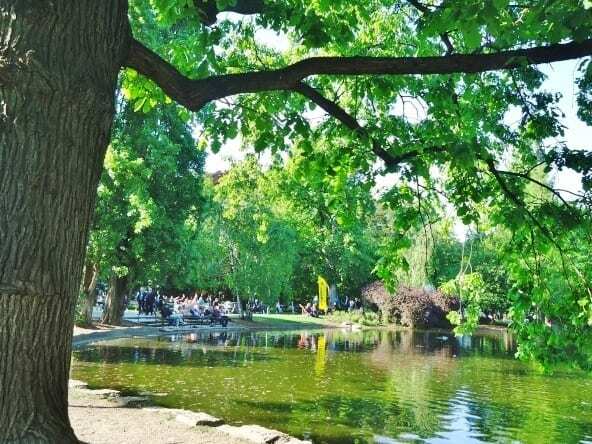 “For the fourth consecutive year, Vienna was ranked as the number one city with the highest quality of life” . Comments? 🙂 Nice city, good post. Cool! I really want to check out am himmel. It’s always nice to get a wide view of vienna. ^_^ If you want to check out the map of all the cool places I’ve run into in Vienna over the years take a look! http://offbeatwien.wordpress.com/ cheers! Regarding free wifi, it’s actually extremely easy to find in Vienna. Pretty much all the major squares and streets in and around the city center have it. As a tourist who will spend mort of their time in that general area, free wifi is always just around the corner. I am planning to visit Vienna for Xmas and New year with my wife and 4 years old son. Really appreciate a good recommendation for hotel / apartment stay. We will be there for 10 days and really would like to visit as much place as possible. We will not be skiing but wold love to see some snow in the process..
Not too far from Vienna is the Stift Melk- a must see, and also the Reigersburg Falconry show, you go to the Reigersburg Castle, ride the elevator to the top and go see the show where the birds will actually fly over your head so close you can feel their feathers! Thanks Stefan. Love free wifi! Very cool post about my adopted city, Vienna! If you are visiting Vienna and need information about wheelchair accessibility please let me know. I’ll be glad to check things out for you on the spot. Thank you for your pretty nice article! Good to read it. I often go to wien and wien airport if I go to business trip or just to visit friends. The “getting there and away” topic is very usefull and I would like to add to this the airport taxi because if I am in hurry this is the best way to get to the city from/to the airport. I tried wientransfer ( http://www.wientransfer.com ) and it was correct because of the price and the exact arrival. Vienna is a wonderful city. I live in Vienna and I enjoy my life here. The most important argument you should visit Vienna is to see all the sights. For example you are able to visit Schönbrunn castle. There are also a lot of national parks you are able to do a picnic with your family. At the winter saison I would like to recommend the christmas markets and have a great walk to the Rathausplatz. I wish you all a wonderful stay in Vienna. Vienna seems so beautiful, cant wait to go there. We also enjoy living and working in Vienna! And thanks to the job we do and our clients from different parts of the city, we get to experience Vienna in all its diversity and beauty. A truly magical and unique place!